Western Blot analysis of MYO1D expression in transfected 293T cell line (H00004642-T01) by MYO1D MaxPab polyclonal antibody.Lane 1: MYO1D transfected lysate(47.96 KDa).Lane 2: Non-transfected lysate. 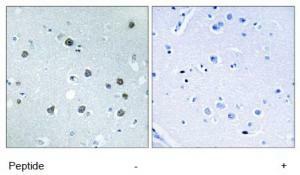 Immunohistochemistry analysis of paraffin-embedded human brain tissue, using MYO1D Antibody. The picture on the right is treated with the synthesized peptide. 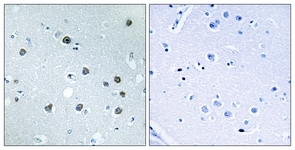 Immunohistochemistry analysis of paraffin-embedded human brain tissue using MYO1D antibody.The picture on the right is treated with the synthesized peptide.